As you know, national flower of Japan is Cherry Blossoms. 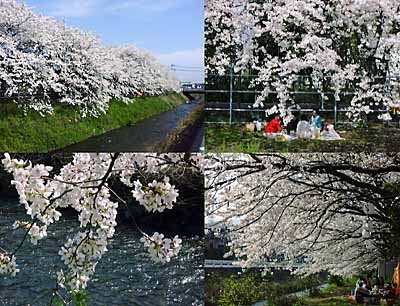 Everywhere in the country, it is not difficult at all to find Vista Point of Cherry Blossoms. Here in Minami-ashigara, you can enjoy Cherry Blossoms in early April. The photos above show one of my favorite places. As you see, people are enjoying Picnic Party under Cherry Blossoms. Especially, "Drinking Party under Cherry Blossoms at Night" (of course, you need lighting facilities to see blossoms) is Japanese favorite activity.They celebrate "Spring has come" with Cherry Blossoms.